Notification Center on Mountain Lion is quite useful. But sometimes, you end up with a bunch of stacked notifications that you’re not quite ready to dismiss—but that are annoyingly covering up important stuff on your screen. Here’s how to handle it. We all use our own approaches for staying organized. For better or worse, I tend to manage my day to day life with Reminders—specifically, Apple’s Reminders app for the Mac, iPhone, and iPad. 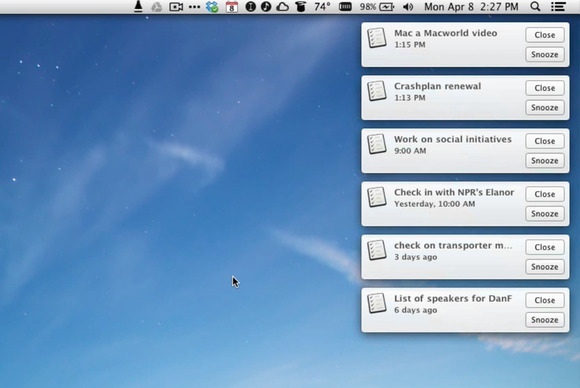 Here's another video I once made about how I schedule reminders more quickly on the Mac. But now, I just want to show a couple quick tips for when you’re suffering from Reminders overload. As you can see in the video, I have several reminders stacked up from Notification Center on the side of my screen right now. These aren’t faked; I need to deal with all of these. If I dismiss the reminders, they’re out of sight, out of mind. That’s no good. But sometimes I need to see whatever content is underneath those banner notifications. You can flick reminders off the edge of the screen if you click on them and toss them away. But they’ll come back in about ten minutes’ time. You can, of course, simply drag a window out of the way, if that’ll help, or resize it. You can resize a window by clicking and dragging any of its sides; I also like the use the third-party Moom utility, which makes the green button in the titlebar more helpful in these situations. When flicking won’t work—because, perhaps, you need more than a 10-minute reprieve from your reminders, but not a permanent one—and when resizing isn’t helpful enough, go to the nuclear option: Open Notification Center by either clicking on the Notification Center icon at the upper right of your menu bar, or swiping from right to left from the edge of your trackpad. Then, scroll past the top of the list, and disable Notification Center for the time being. Your banners vanish, but you can turn them back on whenever you’re ready; they’ll turn on automatically by the next day, too, which is helpful since you can’t exactly rely on a reminder to turn them back on.